I've made it no secret that I strongly believe in taking a daily Multi-Vitamin/Mineral (at least a twice a day). Unfortunately, too many people reach for cheap inadequate products, that offer them no benefits. While I do believe that we should get most of our nutrients from food, keep in mind our sources are depleted and not what they used to be. Since 1933, the government has been putting minerals (INORGANIC) back into our soil. Irridation, pesticides, chemicals etc have eroded the value and depleted out soil of the nutrients it once contained and passed on to our food sources. Chemicals, pollution, toxins in our environment, disease and stress have all made us leech nutrients from our body tissue and cells at an alarmingly fast rate- leaving us depleted and subsisting and sub-prime levels. Think of a proper multi as insurance- or bridging the gap, so we can function at peak and efficient levels. Using a proper multi during the day, allows our bodies to preserve their own nutrients, and tops us up. I like the use the analogy of a dried up sponge . The multi tops us up, and then anything additional coffers THERAPEUTIC benefits (not just systemic). Using them during the day, allows us to "run" off of them, and not leach the nutrients from our cells, tissue, muscle etc. Our bodies are in disequilibrium- just to maintain homeostasis (state of being in balance- kidney function, blinking, breathing) we are using processes and drawing from already scarce reservoirs in our bodies. We are using Metabolic Enzymes as Digestive Enzymes etc. Using a proper multi just gives us additional support and gives us the proper nutrients on a cellular level to take the stress and burden off of our bodies. One product I really do like is Nutrabolics Vitabolic Full Spectrum Vitamin and Multi-Nutrient Complex. I have recommended it to many clients with great success. While it does lack Iron, I still do recommend it to females of all age groups. I prefer taking a separate iron pill, so I can regulate the amount and the TYPE of iron. This multi is great for any active or stressed individual, or someone looking for great antioxidant support. It contains Bio active and high amounts of all the B-Vitamins, Vitamin D3, CoEnzyme Q10 (our spark plug nutrient), properly chelated minerals, and a cornucopia of freeze dried antioxidants in the form of berries, greens, vegetables (including Shiitake mushrooms, aloe Vera, Brussel Sprouts, Lycopene, Lutein, Resveratrol ) etc. While these dosages are smaller (think of them as a garnish) they are still a nice afterthought. Most impressively, is that they actually include the PROPER form of B-12 (the METHYL group- methylcobalamin), which is the bioactive, beneficial form of B12. People keep raving about B12, and buying supplements, but they don't realize that most contain the cheap Cyanacobalamin form. The benefits of Vitamin B12 are well documented. This very important nutrient helps support higher energy levels, emotional stability, mental clarity and more. Vitamin B12 has also been associated with lower homocysteine levels which helps lessen the risk of heart disease. You probably understand the importance of supplementing B12. Why "Methyl " Vitamin B12 is more effective. There are primarily two different ingredients being used in sublingual b12 supplements. They are cyanocobalamin and methylcobalamin . The cheapest and most common option for use in supplements is cyanocobalamin. The reason for this is that the liver must convert cyanocobalamin to methylcobalamin before the body can utilize it. Methyl B12 supplements contain the most bioavailable and active form of B-12. Since it requires no conversion by the liver, it is in a form ready to be used by the body (and lessens the burden on our already overtaxed liver). Traditionally, the trouble with most multivitamin/multimineral formulations is that they have seriously lacked absorbability. But because we insist on the utmost quality and potency, our scientists ensured that our formulation would contain only Bisglycinate Chelated minerals, which are by far the most absorbable form, yielding the most potent effects. The result is VitaBolic, a highly concentrated and biochemically active supernutrient complex that kicks the crap out of all those generic, boring, and impotent multivitamins out there. It’s because YOU insist on results that WE insist on quality! While most athletes understand the importance of proteins, carbohydrates, and fats, many fail to realize the true value and utter necessity of micronutrients, antioxidants, and phytochemicals; all of which play a crucial role in developing greater health, performance, and muscle. Much like our high octane whole food supplement Fighter’s Food, VitaBolic addresses the need for athletes to consume nutrient dense foods and supplements daily in order to realize the long-term goal of increased strength, size, and performance. This is why our scientists formulated the most nutrient dense and biologically active food supplement in the industry. It’s not a luxury, it’s a necessity! Engineered Phytonutrient Complex: VitaBolic delivers high potency ingredients for nourishing the body and fighting the deadly effects of oxidative stress. Boasting a blend of the most potent phytonutrients, indoles, and biochemicals, Vitabolic is scientifically formulated to offer a systemic (whole body) nutritional solution to the problem of cellular decay. 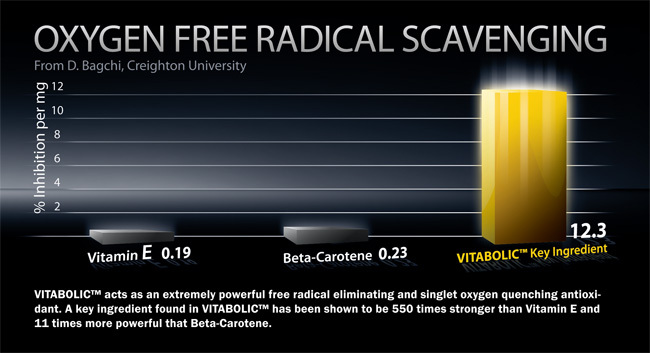 Each serving of Vitabolic contains the nutritional equivalent of EIGHT servings of both fruits and vegetables combined. Ridiculously powerful! Freeze Dried Extracts from Berries and Vegetables: Premium freeze-dried extracts of greens and berries are the only researched forms that are proven to prevent cancer, create optimum health, and fight free radical oxidation. Freeze drying removes water from fruits and vegetables while preserving 100% of the biologically active antioxidants and phytonutrients. In terms of biological activity, VitaBolic possesses powerful enzymatic activity and full spectrum micronutrients and antioxidants.ii. Advanced Carotenoid Complex: Carotenoids are a class of natural fat-soluble pigments found principally in plants and algae. In humans, Carotenoids play a critical role in protecting our cells against the damage caused by free radicals. 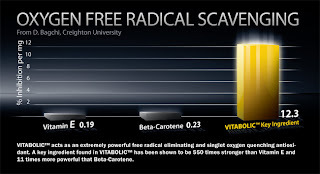 In fact, the most notable of the carotenoids supplied in VitaBolic is the patented BioAstin, an ultra- powerful antioxidant derived from deep ocean microalgae. Clinical trials have shown BioAstin to possess 550 times the antioxidant power of vitamin E and 10 times that of beta-carotene. Better still, BioAstin has also been used to alleviate knee pain and Carpel Tunnel Syndrome. With a resume like that, it is clear why carotenoids are some of the most potent antioxidants known to man. And that’s also why we’ve included a heavy dose of them in our VitaBolic formula. iv. iCasagrande SS, Wang Y, Anderson C, Gary TL. Have Americans increased their fruit and vegetable intake? The trends between 1988 and 2002. Am J Prev Med. 2007 Apr;32(4):257-63. Suggested Facts: As a dietary supplement for athletes and bodybuilders, take 1 tablet 30 minutes after morning meal and 1 tablet after afternoon meal. I didn't know about those differences in B 12 vitamins! Thank you!